The position of Uranus at opposition on 19th October. Chart for 23h 30m. Urnaus 7.7° east of the meridian at altitude 40.4°. 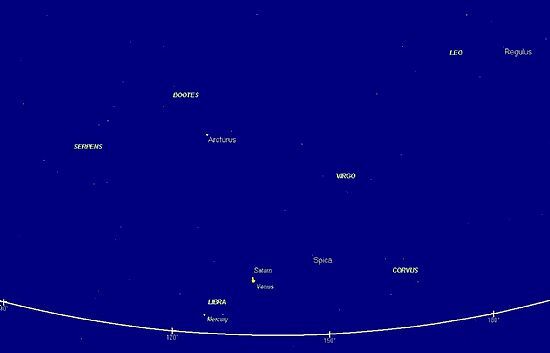 Path of Uranus from October 1st to December 1st 2017. A satellite in general terms may be defined as a companion to a controlling, more influential body. In astronomy, before the advent of modern space technology, the term satellite was applied specifically to a smaller attendant body orbiting a larger body, as in the case of the Earth and the Moon of which the Moon is the satellite to the Earth. It should be noted that "Moon" is given a capital letter since it is a proper noun. The term moon has long been used as an alternative to the word satellite when referring to natural satellites in the Solar System. Many reference sources do in fact define the words moon and natural satellite as synonymous. This practice is perhaps more admissible at the present time since it distinguishes between natural satellites (moons) and artificial satellites or probes orbiting bodies in the Solar System. Apart from reference to lunar, implying to do with the Earth's natural satellite—the Moon—our satellite has no other name recognised within scientific cultures. However, the author prefers the words natural satellite to moon when referring to natural satellites in the Solar System. Whereas the Earth and Mars have one and two satellites respectively, planets in the outer regions of the Solar System (excluding Pluto, of course) all have a number of satellites; new ones are being discovered all the time though, this trend has probably slowed in recent years. The Moon has the largest size ratio to its primary (the Earth) of all natural satellites now that Pluto has been relegated to the designation of "dwarf" planet. Pluto diameter 2390 km., Charon (satellite) 1186 km., moavm* 17.3. Earth diameter 12756 km 12714 km equatorial/polar diameters respectively. Moon diameter 3473 km 3472 km equatorial/polar diameters respectively. Apparent visual magnitude of an average full moon –12.7. Mars diameter 6794 km 6750 km equatorial/polar diameters respectively. Before moving on to Jupiter, the largest of the planets within the Solar System, we should mention the main asteroid belt lying between the orbits of Mars and Jupiter. The “law” suggested that there should be a planet lying in an orbit between the orbits of Mars and Jupiter. This in the late eighteenth century led to a determined effort to search for the unknown planet that resulted in the fortuitous discovery of Ceres by Piazzi in 1801 This, was the first of the now well known quartet of asteroids Ceres, Juno (1804), Pallas (1802) and Vesta (1807). 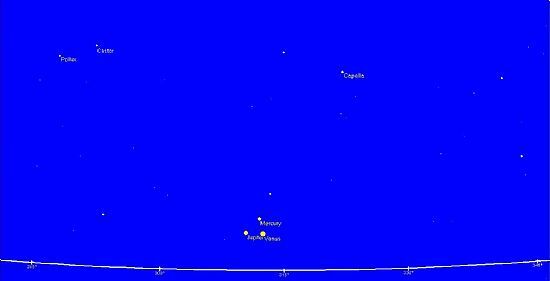 Although the largest of the quartet Ceres (dia 787 km) is by no means the brightest, that distinction falling to Vesta (dia. 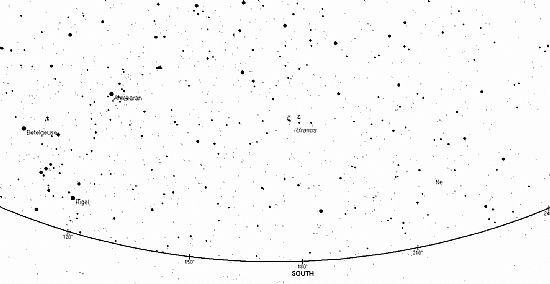 400 km) which at times may become a naked-eye object at visual magnitude 5.7. It was not until 1845 that a fifth asteroid (Astraea) was discovered by Hencke. Since then, and with the advent of photography, many thousands of asteroids have been observed. The important feature to note is that the orbits of asteroids tend to have eccentricities greater than that of the planets, excepting Mercury. This means their apparent magnitude at opposition will vary considerably well demonstrated in the case of Astraea. traffic jams and endless plastic. As most readers will know, apart from very rare occasions when Mars is at its closest to Earth, Jupiter is the next brightest planet to Venus as seen from Earth. At close oppositions Jupiter will reach an apparent visual magnitude of –2.9, when its largest satellite, Ganymede (dia. 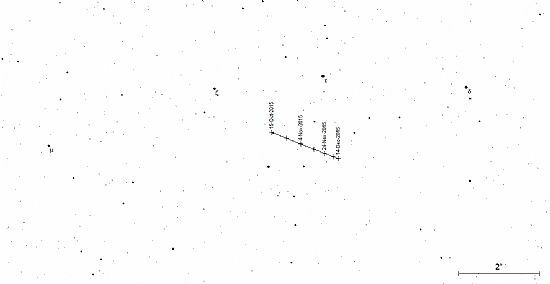 5262km) may have an apparent visual magnitude of 4.6, marginally fainter than that of Taygeta, the 6th brightest star in the Pleiades open cluster. 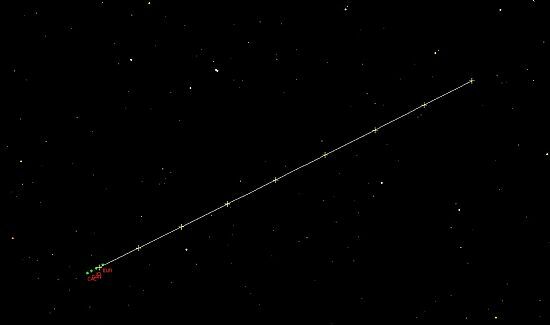 In fact all four of Jupiter’s largest satellites would be visible to the unaided eye were it not for the proximity of the brilliant planet itself. Ganymede is in fact larger than planet Mercury (diameter 4879 km). As may be seen from the table above, Saturn has nothing to equal Jupiter in the number of large satellites. Titan is exceptional and is indeed the second largest satellite in the Solar System and, again, larger than planet Mercury. The trio Tehtys, Dione and Rhea are of comparable size to one another but much smaller than Titan. By contrast with the four Galilean satellites of Jupiter, Titan is a faint telescopic object but by no means difficult even in apertures as small as 75mm. Rhea too, despite being approximately 1/3 as bright as Titan, is also observable in modest instruments. It will be seen from the table that the four brightest satellites of Uranus are a good deal fainter than anything we have considered so far. They require a telescope of at least 180mm aperture to be seen and are best imaged with a focal length of 800mm or more. We frequently record four and sometimes five satellites with a Nikkor 800mm f/5.6 using exposures of between 8 and 12 seconds. On occasions (depending upon seeing conditions and satellite positions in relation to Uranus itself) smaller instruments may be used to image at least three of Uranus’s satellites. Triton is the only satellite capable of being imaged using focal lengths of 600mm. Again, a Nikkor 800mm f/5.6 is quite adequate for the purpose with exposures in the region 15 to 20 seconds. We have also achieved modest results with a 150mm aperture f/5 achromat. Observing the planets for satellites. 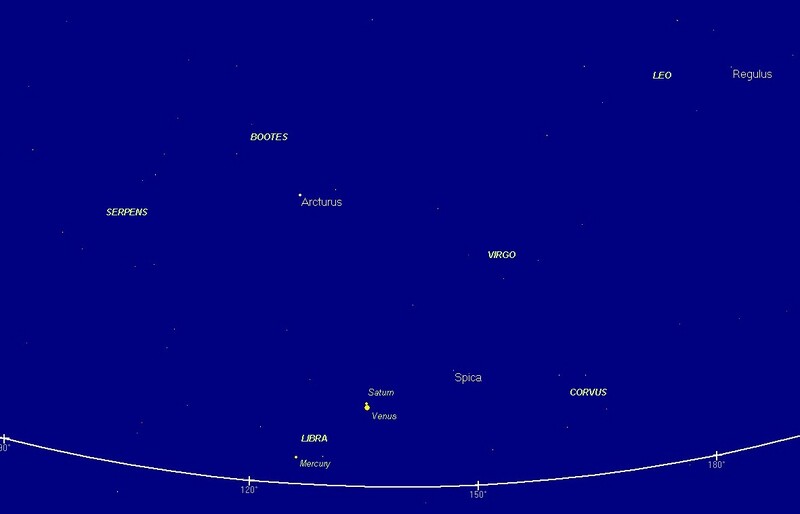 At the time of writing, only Jupiter is still readily accessible to northern hemisphere observers as it moves through constellation Leo on track for Virgo in 2016. Saturn is now well down in the southern celestial hemisphere in constellation Scorpius and will not return to the northern celestial hemisphere until 2025, a year in which it will be in close alignment with Neptune. 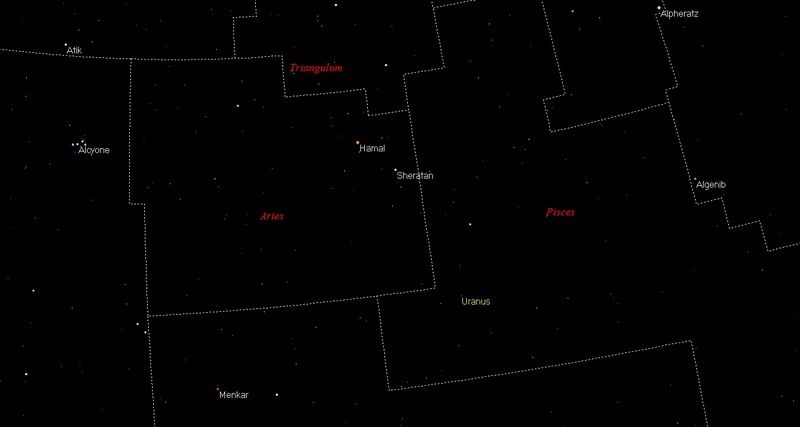 Uranus is reasonably well placed for observation during autumn and early winter being some 6° north of the celestial equator in constellation Pisces and improving for northern observers as the planet moves towards constellation Aries. We give the path of Uranus in chart. 2 (below) for those wishing to take up the challenge of imaging some of Uranus’s satellites in the coming weeks up to December 14 2015. 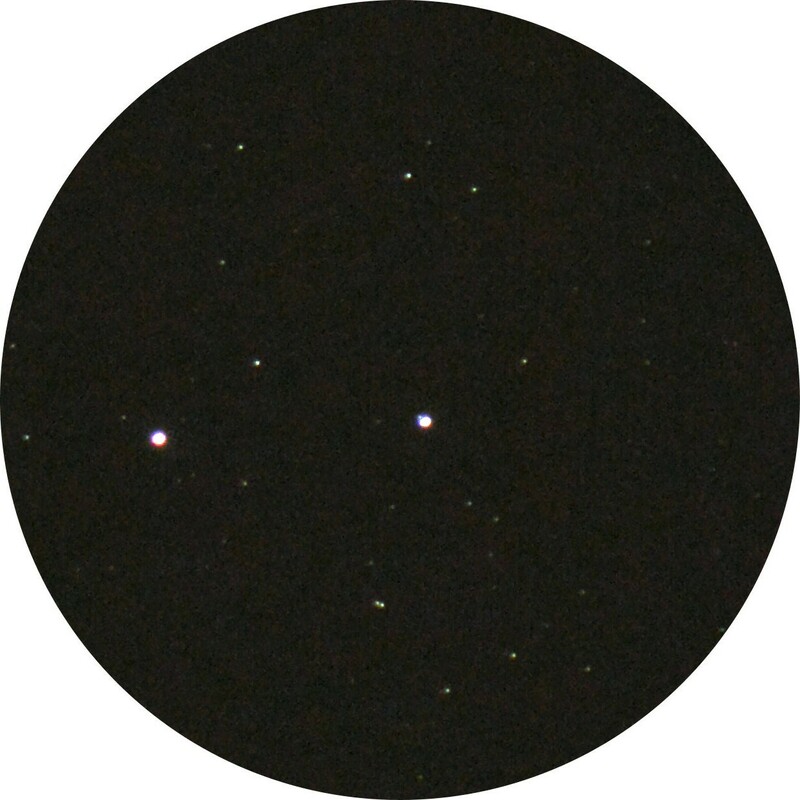 This displays stars to magnitude 10 and may then be referenced to the small scale Chart !, using the two stars zeta and epsilon Piscium shown in both. NOTE: Uranus is in retrgrade motion for this duration. 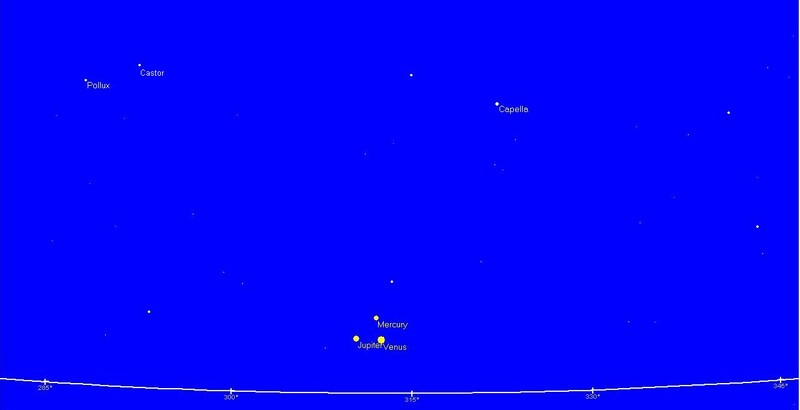 Neptune likewise is steadily increasing in altitude for northern observers but is currently quite low down of an autumn evening in constellation Aquarius. 2014 September10. Neptune with satellite Triton. 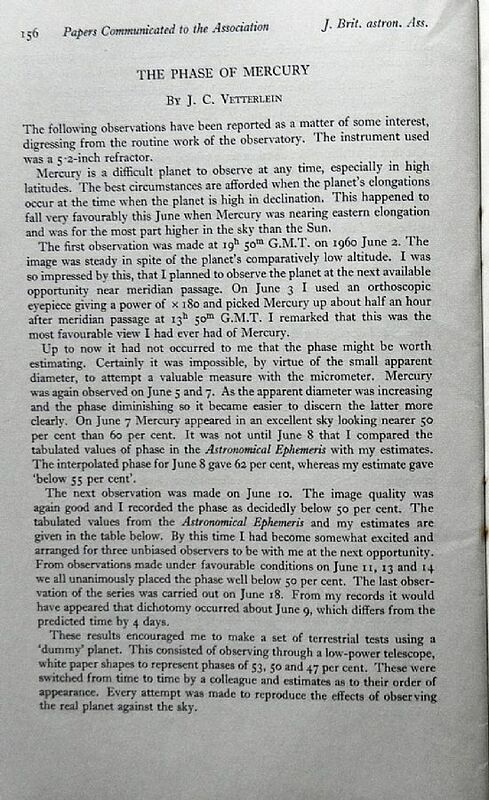 Note the planet was approaching the southern meridian at the time of this observation. 2014 July 01. Jupiter and Venus a little under 3 hours following conjunction in longitude, imaged 2015 July 01 at 10h 39m UT. 100mm f./9 apochromatic doublet at power 45x; Canon IXUS 310HS, 1000 sec. exposure ISO 200. The angular separation for the two planets (centre to centre) was 22' 00". The sky gave poor transparency due to haze as well as indifferent seeing quality. Jupiter scarcely discernable (shown “highlighted” between two white lines). 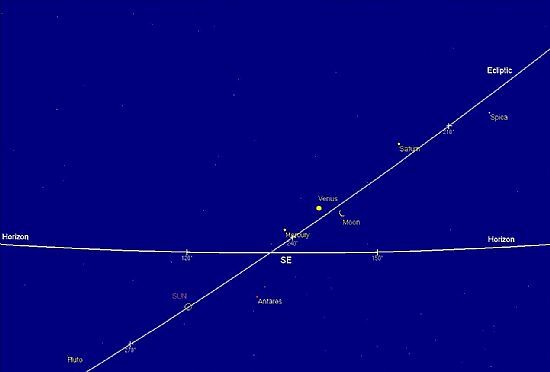 Closest approach at conjunction in longitude took place at 2015 Jul 01at 07h 50m when the planets were separated by 20' 41". 2014 June 30. Jupiter and Venus approaching conjunction. 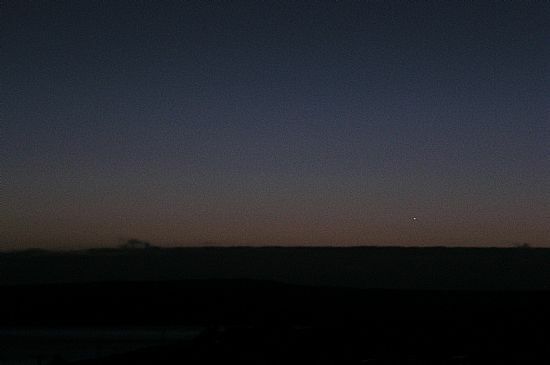 Jupiter and Venus approaching conjunction, imaged 2015 June 30 at 18h 25m UT. 100mm f./9 apochromatic doublet at power 45x; Canon IXUS 310HS, 1000 sec. exposure ISO 200. The angular separation for the two planets was 23' 34". (Left click to enlarge.) Jupiter top left. 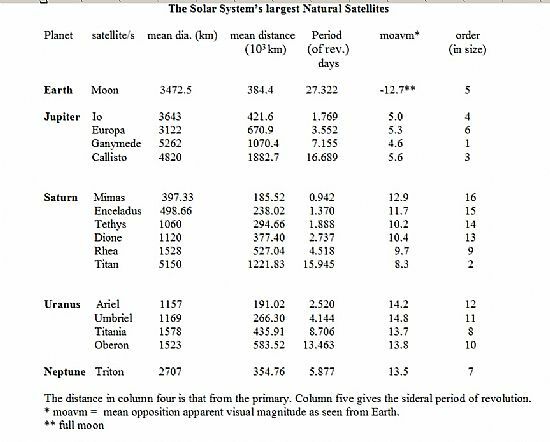 Note that the planets subtend almost identical apparent angular diameters at around 32". Today’s relatively close conjunction between planets Jupiter and Venus raises the interesting question as to whether a conjunction could be so close as to find Venus actually transiting the disc of Jupiter. Such a close encounter will take place in 2065 Nov 22 12:43 0° 00' 14" when Venus will appear to transit the lower half of Jupiter’s disc. At this event the two planets will have an elongation from the Sun of only 7.9° making for a very difficult observation from ground-based telescopes. A more interesting conjunction takes place in 2123, September 14 (Dia.1). On this occasion the planets will have an elongation from the Sun of 16.3°, making the observation quite feasible with telescopes of 150 mm aperture having the object glass shielded from direct sunlight. Dia. 1. Venus at first contact 2123 Sep. 14 at 15h:15.7m UT. Whether there will be any human inhabitants on planet Earth by 2123 is more problematical. 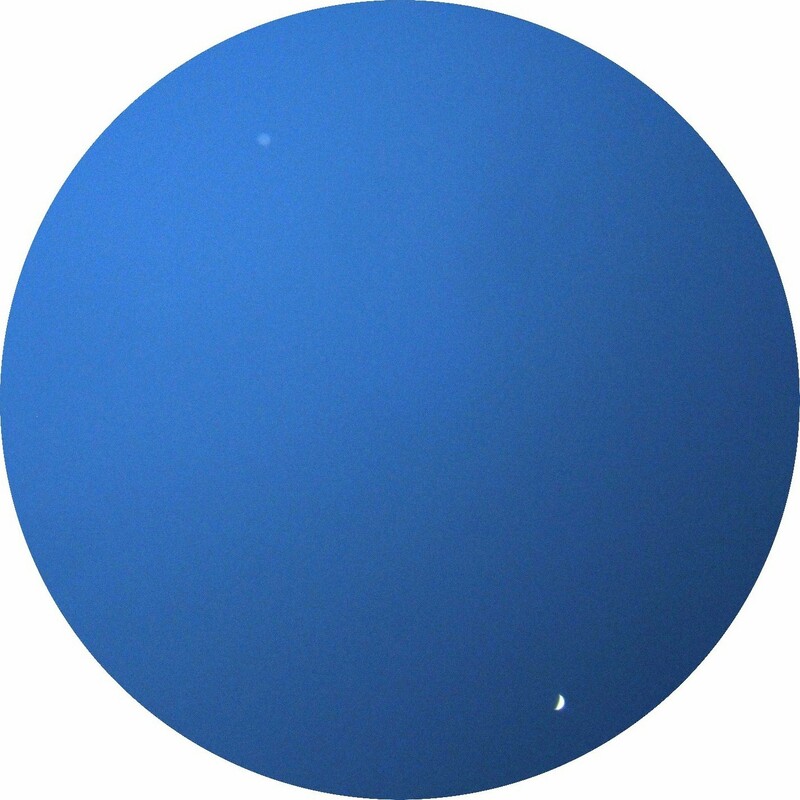 2014 October 15: Uranus and three satellites. The planet, at visual magnitude 5.7, is overexposed of course. The satellites are, from north to south (top to bottom): Oberon mag. 13.9, Titania mag. 13.7 and Ariel mag. 14.2. Mercury, Jupiter and Venus in the May evening sky. Commencing on May 10, 2013, a number of interesting celestial events involving three of the brightest planets, Mercury, Jupiter, Venus and the Moon will take place in the evening sky shortly after sunset. We should say at the outset that a good, clear horizon (preferably a sea horizon) will be necessary in order to see the series of conjunctions, especially the early stages. 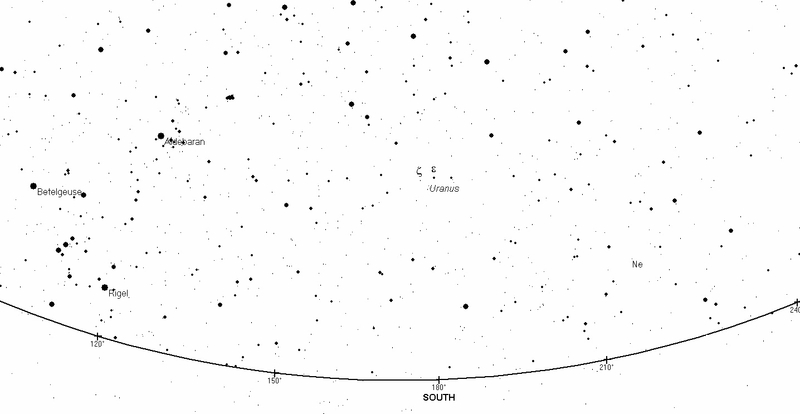 Diagram 1 below shows the sky on May 10 at 20h 50m UT looking a little west of NNW only 24 minutes after sunset. Binoculars will be necessary at this time in order to pick out Jupiter and Venus. 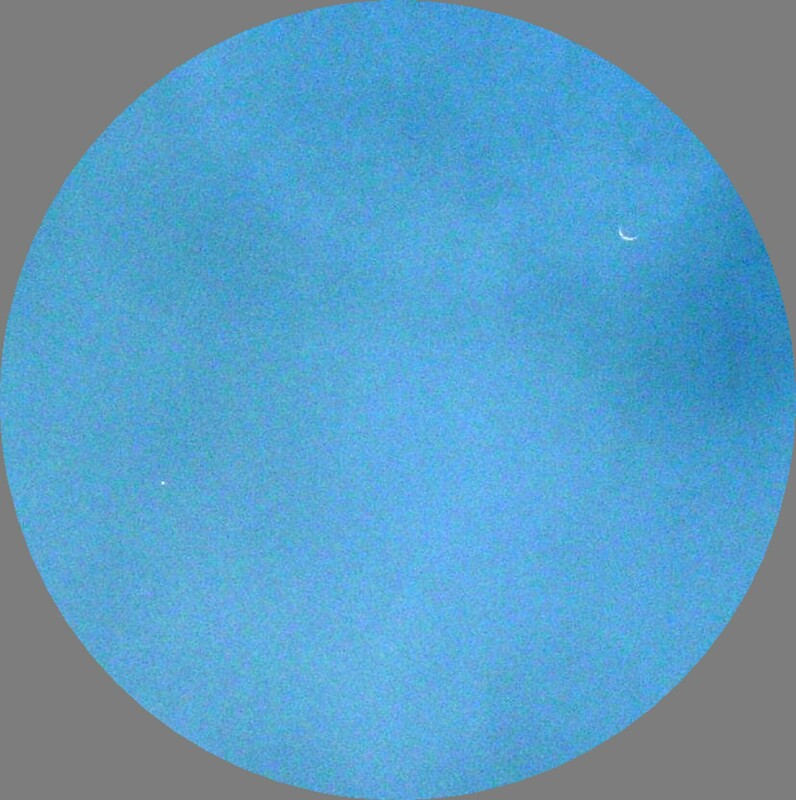 It is unlikely the thin, crescent Moon (phase 0.7% elongation from the Sun 9.5, age 20h 22m) would be visible at this altitude even with binoculars. 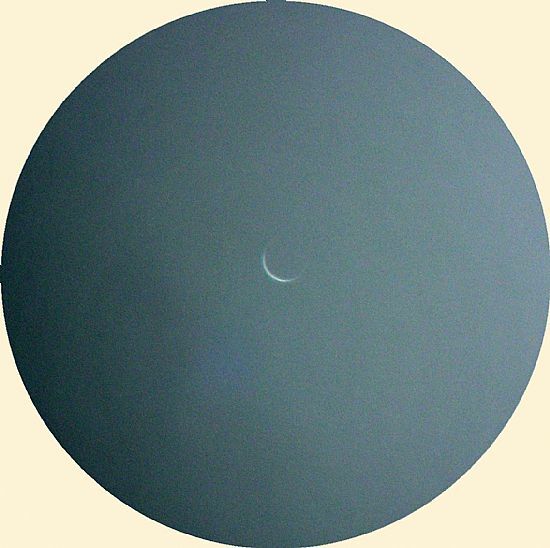 (The record for seeing a new crescent moon using optical aid stands at 11h 40m.) An hour later and Venus will have set but Jupiter should be discernable with the unaided eye. It should be possible with good conditions to use the brilliant Venus and Jupiter as guides to locating Mercury which by this time will dropped in magnitude to –0.8, approximately twice as bights as the brilliant star Capella (above right). Dia. 1 The sky looking a little west of NNW on May 10 at 20h 50m UT. Dia. 2 The sky looking a little west of NNW on May 18 at 21h 30m UT. Dia. 3 The sky looking a little west of NNW on May 26 at 21h 40m UT. 2013 February 08: Mercury/Mars conjunction. One of those fortuitous occasions when the skies cleared for a few hours following many consecutive days of cloud. 2013 February 08, 17h 40m UT. Mercury in the evening twilight a little west of Trumland Farm buildings as seen from the road above the pier, Rousay. A 1/30 sec. exposure Minolta Dimage F200, ISO 400. (Mars was too faint to show on this exposure.) Left click to enlarge. Mercury/Mars: apparent angular separation (centre to centre) 15' 36". Over the past several months we have been treated to a fine showing from the two brightest planets seen from Earth with both Jupiter and Venus having been observable in dark skies. 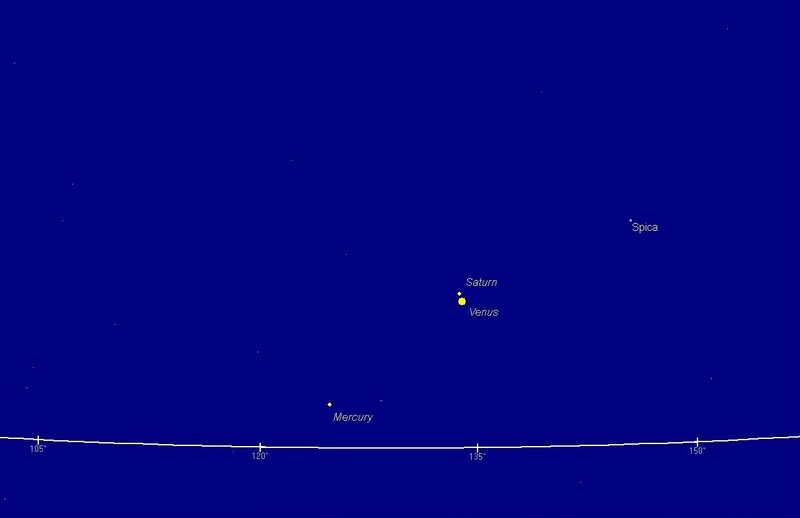 On the morning of November 27 Venus passes south of Saturn by approximately 30 arc-minutes (about the angle subtended by the Moon as seen from Earth). Saturn will appear almost as bright as the star Procyon and substantially brighter than nearby Spica. In addition, Mercury will be visible someway to the east of Venus at magnitude 0.3 (somewhat fainter than Arcturus above). See dias. 1 & 2. It should be possible to observe Mercury for a little over three weeks as the planet steadily increases in brightness to reach magnitude –0.5 by December 20th. During this period Venus will appear to move towards Mercury (see dia. 3). Venus will act as a very useful pointer for Mercury. Dia. 1 Early morning sky looking SE at 06h 55m UT 2012 November 27. Dia. 2 Early morning sky looking SE at 06h 55m UT 2012 November 27 (large scale). Jupiter reaches maximum brilliance (mag. –2.8) at opposition on December 3rd when it crosses the southern meridian at approximately midnight. This means the planet rises (in time) close to sunset and sets close to sunrise. Thus, all four planets will be in the morning sky together, although Jupiter will of course be in the north west close to setting. 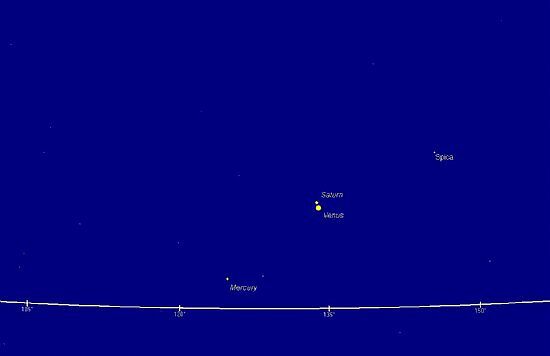 Venus, as many may have noticed, is edging ever more closely towards the south rising later in the morning by the day. From December 10th the planet will no longer rise into a dark sky, and by early next year will be lost to the unaided eye for a considerable number of months. There is also the interesting situation when both inferior planets Mercury and Venus (orbits in relation to the Sun within that of the Earth’s), are in transit on the Sun’s disc. At a central transit no sunlight can reach the side of Mercury facing Earth. Therefore in the case of Mercury the appearance of the planet against the Sun as background is that of a perfectly black body. 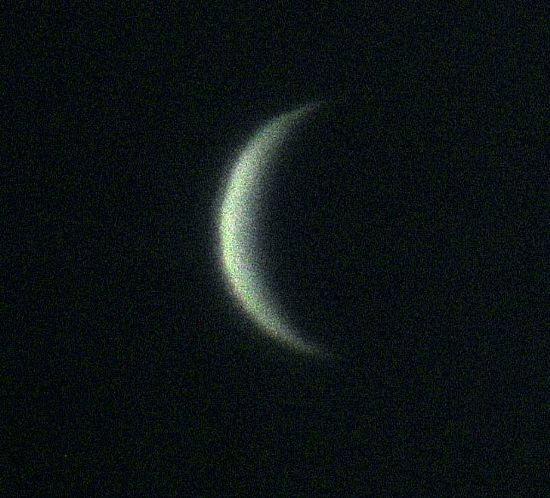 With Venus, as we have just described, some light is reflected and refracted along the limb and so in theory Venus is not wholly black. So, therefore, despite both Mercy and Venus being inferior planets, their apparent brightness seen from Earth are NOT replicated. For example, Mercury is at its brightest when close to superior conjunction (phase around 100%) with the Sun, whereas Venus is at its brightest when close to greatest elongations (phases around 50%). At certain superior conjunctions Mercury may reach a visual apparent magnitude of –2.3, or about twice as bright as Sirius, the brightest star. Of course, then being so close to the Sun in the sky, Mercury cannot be observed with the unaided eye. But those experienced in the use of the telescope in daylight may have the opportunity to observe Mercury when close to superior conjunction. I have myself observed the planet with a 85mm refractor to within 1 arc-degree of the Sun’s limb (the object glass suitably screened from direct sunlight), but this practice should never be attempted without expert supervision for fear of bringing the Sun into the field. At its brightest on a favourable opposition Mars can equal or even exceed Jupiter in brightness, at least for a few days. But owing to Mars’s eccentric orbit, and the fact that its distance fluctuates widely owing to its position with respect to Earth, it may appear from the other side of its orbit fainter than Regulus, the faintest of the so-called first magnitude stars. Dia 3 Early morning sky looking SE at 07h 30m UT 2012 December 11 showing the Sun, Moon and some planets in relation to the ECLIPTIC. Early morning elongations for planets west of the Sun offer the most favourable geometry for seeing the planets in autumn to early winter. Dia 3 shows the position of the Sun in relation to Mercury Venus, Saturn and Moon on the morning of December 11 at 07h 30m UT. It will be seen all five appear near to the elliptic, with the Sun lying symmetrically upon that line which, of course, represents the apparent path of the Sun against the stellar background. The steeper the angle between the horizon and the ecliptic the more favourable the opportunity for seeing planets when close to the horizon. A similar argumnet applies (applicable to northern hemispere, reverse argumnet for the southern ehmisphere) in springtime for evening observations. Jupiter in Taurus – a short treatise on motion. Jupiter is by far the most prominent star-like object to be seen in the night sky for the forthcoming many weeks. 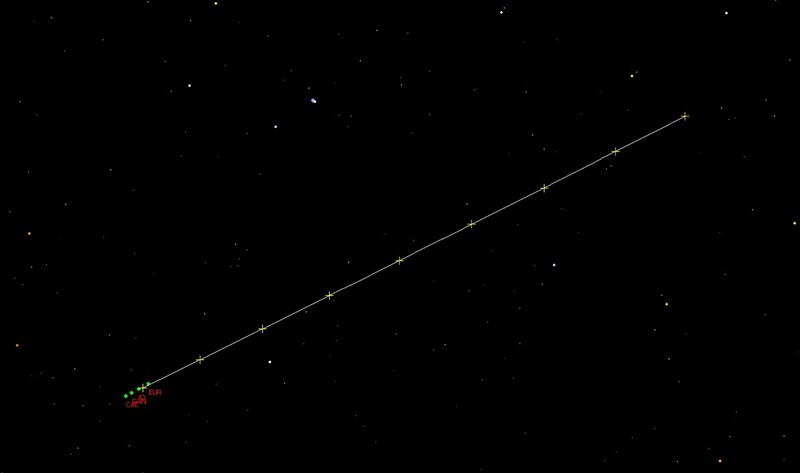 The planet’s motion is currently retrograde (east to west as seen from the northern hemisphere) and will remain so until January 29, 2013 after which it will track forward again bringing it into the constellation Gemini by late June of that year. The so-called stationary point (merely a consequence of juxtaposition, the planet does not actually halt in its orbit anymore than does our Earth!) 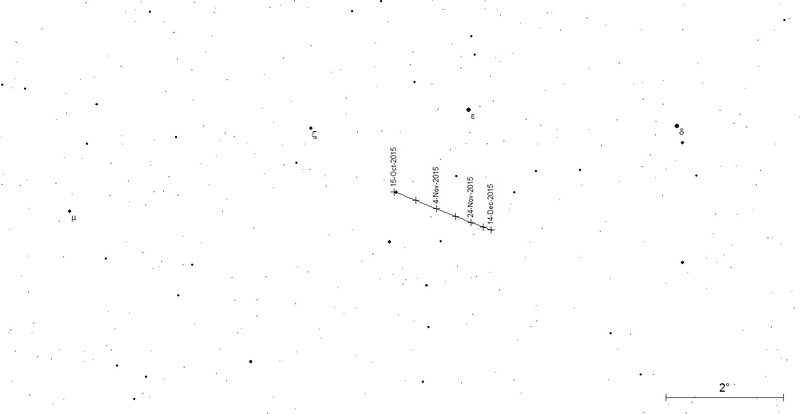 takes place with Jupiter appearing almost halfway between the two open clusters of the Pleiades and the Hyades (bright, red star Aldebaran at is centre). When I was finding my way around the sky as a young teenager my father would refer to this star affectionately as “All-de-bearan”. For some reason this pronunciation seemed to suite the star and so I share this confidence now with all who read this (potentially the entire world!). Jupiter appears to move quite rapidly against the background of stars. Currently this is around 450 arc-seconds in 24 hours, or about ten time the planet’s apparent polar diameter, in that period. We saw in the case of Uranus how few and far between were close conjunctions with comparatively bright stars. Owing the Jupiter’s more rapid movement the opportunities increase accordingly, as the diagram below may indicate. The comparative brightness between stars in the path of Jupiter may be judged by the size of the “dots” indicating the four major satellites (in green). Of course, one must reckon with the fact that in many instances conjunction will take place in daylight. Were it not for their close proximity to the brilliant globe of Jupiter itself, all four satellites would be visible to the unaided eye. The smallest of binoculars will reveal the satellites. Ganymede will therefore be seen to be nearly as bright as the sixth brightest star (Taygeta, mag. 4.28) in the Pleiades cluster. 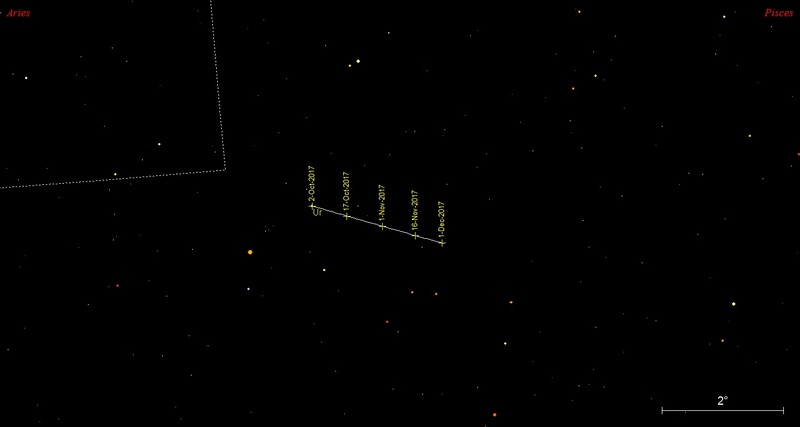 Opposition in longitude between Jupiter and Sun in 2012. Please go to the SKY VIEW page for a wider appreciation of Jupiter against the star background. Many readers may be aware of the so-called phase anomaly purported to exist for the planet Venus. In clear terms what is implied is the apparent discrepancy between the observed and calculated phase for the planet Venus close to maximum elongations from the Sun. A number of papers on the subject have appeared from time to time both theoretical and practical (Brian Warner, Simon Archer and myself for example). 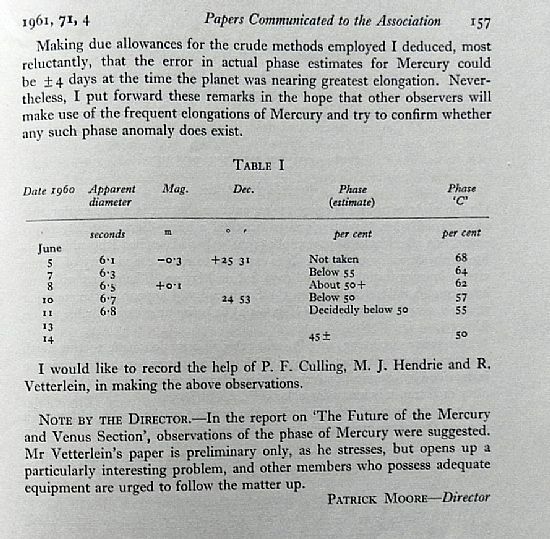 In 1960 I carried out a short programme of observations on Mercury using a 5.2 inch refractor at Brentwood, Essex. The results were given in a short paper reproduced here from the JBAA 1961, 71, 4. The apparent (estimated) phase and the calculated phase for a number of days in 1960, June.are given in the table. This year (2012) on June 25, I carried out a similar observation from Orkney using an instrument of almost identical specification to the earlier one, namely a 132mm (5.2 inch) aperture apochromatic triplet. Moreover, from my original notes of 1960 I was able to replicate the magnifications used then, these being 250x and 300x. The 2012 sky was of fine quality the observations continuing on and off for six hours commencing from the time of meridian passage. It is to be noted the best seeing was found in the late afternoon, this despite a lower altitude for Mercury. My estimates for the phase varied between 45% and 50% but mostly indicating something a little less than 50%. Mercury and Venus approaching conjunction: 2012 June 01 at 17h 01m UT. * Movement against star background. Note: To the unaided eye against a suitably darkened sky Venus would outshine Mercury by a ratio of approximately 7:1. 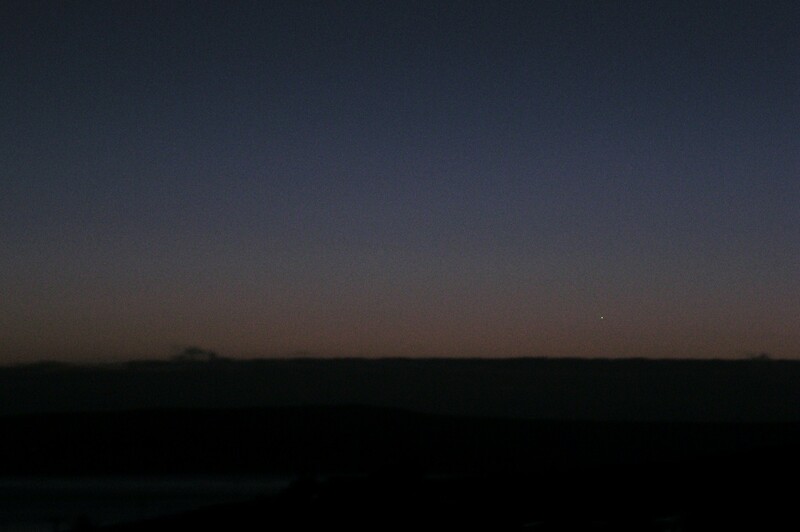 Venus, although closer to the Earth, has a low incident sunlit surface and is approaching inferior conjunction. Owing to cloud, and despite having a sea horizon viewed from a land altitude of 135 metres O.D., it was not possible to see the two planets close to conjunction at 21h 30m (20 minutes after sunset with the planets at altitude 2°. Important Addendum to Venus Transit 2012. The two interior planets Mercury and Venus will be in close conjunction on June 01 a little over four days before the transit of Venus across the Sun’s disc. This is a notable event in some respects. First, Mercury is on its way to becoming an evening object in our skies, though with intense twilight not many will have the opportunity of seeing the planet without optical aid from the Northern Isles (see later additions to the Notice Board). At the time of writing (May 28 15 00 UT) Mercury, as seen from Earth, is at maximum brilliance for this planet at apparent visual magnitude –2.3. Mercury reaches greatest brilliance at and close to superior conjunction but owing to its eccentric orbit about the Sun this brightness is not always reached during these conjunctions. 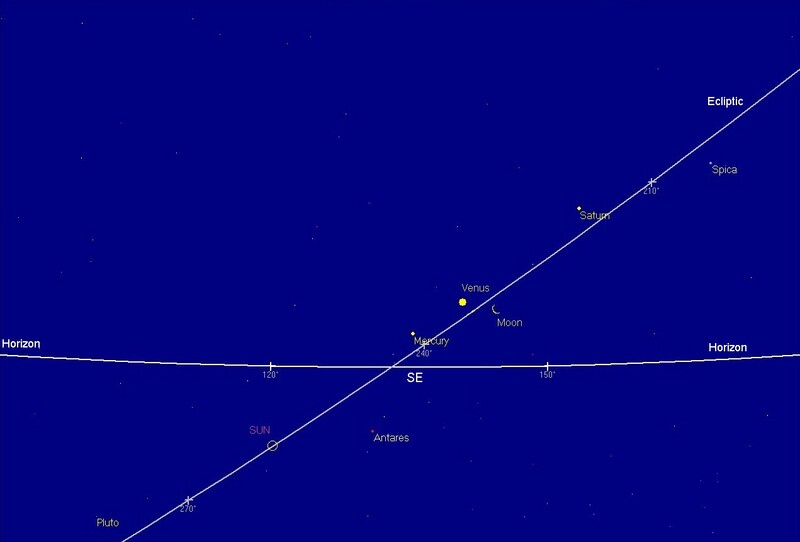 As Venus appears to travel in towards the Sun so Mercury is travelling in the opposite direction and the two come into conjunction on June 01 at 20h 28m when the two planets will appear in the sky at a separation of a little under 12 arc-minutes. 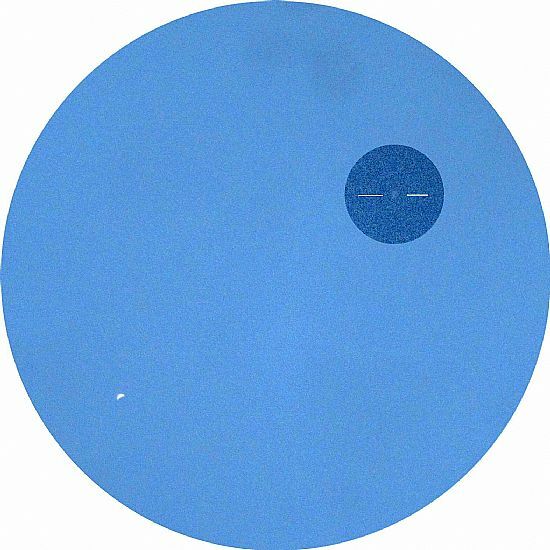 In order to have a chance of seeing this conjunction one will require a pair of binoculars (or small telescope) together with a clean NW horizon (preferably a sea horizon). On June 1 sunset from the location of Orkney is at 21h 08.6m UT, with Venus setting at 21h 54.7m UT and Mercury (appearing a little above Venus) at 21h 58.3m UT. Even with the Sun below the horizon some 20 minutes it should be possible to locate Venus low down close to the horizon altitude 1° 55' and azimuth 318° 22' . This IS feasible; it requires only careful planning, a good sky and a sense of urgency. If nothing else, the Earth’s rapid rotation brings home to us a sense of our mortality! Venus in white light and poor seeing 2012 May 09, 15h 02m UT. 120mm apochromatic refractor 220x Minolta Dimage F200, 1/500 sec ISO 100. Apparent diameter 43.03". phase 19% apparent visual magnitude –4.5.